For those unfamiliar with Monterey Bay, located south of San Francisco, you will have unwittingly seen it in many movies and nature programmes. It is a beautiful area, packed with national parks, ocean views which can be seen from the road or hiking trail, canyons filled with towering redwood trees and waterfalls galore. Perhaps not surprisingly, the area which was initially settled by the Spanish is now home to artisans and artists, writers and people with enough money to enjoy their surroundings. For real Spanish flavour visit the Spanish missionaries in Carmel, Soledad and Jolon which were established in the 1700’s. Monterey Bay has one of the deepest canyons in the world out in the middle of the Bay. Enormous kelp forests, as high as trees have grown in this deep water and become home to sea lions, otters and bottle-nose dolphins. The Bay also forms part of the migratory path for Gray and Humpback Whales. When the Gray Whales migrate north, Killer Whales move in. There are sea turtles and many varieties of fish and shark. The Bay is teeming with sea life of all kinds, celebrated in the local Monterey Bay Aquarium. Parking points at Whalers Cove and Sea Lion point give you a bird’s eye view of the local sea life – it can get quite noisy at Sea Lion Point! If you are interested in engaging with nature, there are some fabulous trails which take in the very best of the county. A 3 day Monterey State Parks pass will allow you to go in and out of any of the (very many) parks, including the “crown jewel”, of the State Park system, Point Lobos, which is a coastal walk allowing you to enjoy the ocean views and wildlife all in one go. Another popular trail is in the Julia Pfeiffer Burns State Park where a one mile trek takes you to the most stunning waterfalls and then through a dark tunnel to the ocean which greets you with a welcoming twinkle in the sunlight. Wildflowers abound and the opportunities available to those powered by two feet are really exciting around Monterey Bay. Otherwise hire a bike, drive the beautiful cliff top roads or even rent a kayak and explore the Bay. Downtown in Monterey Bay there is a “Path of History”, marked by the yellow tiles in the pavement, which you can enjoy whilst stopping off into the many little restaurants and bars which create the entertainment of the historic downtown area. Try the art walks which leave from Pacific Grove and Salinas which take in the sidewalk artists, live music and wine tasting of the area. They happen only once a month for free, but otherwise just sign up. Pebble Beach Golf Course may be a destination for golf enthusiasts – and for those travelling with them, you can always hang out at the bar at the last hole! Even for the non-enthusiast the course enjoys terrific coastal views which make for a lovely walk. Museums devoted to American early culture and civilisations rest easily with museums housing agricultural tools and indications of the early settler’s rural life. Blues Festivals are held alongside more casual entertainment which goes on all year round. 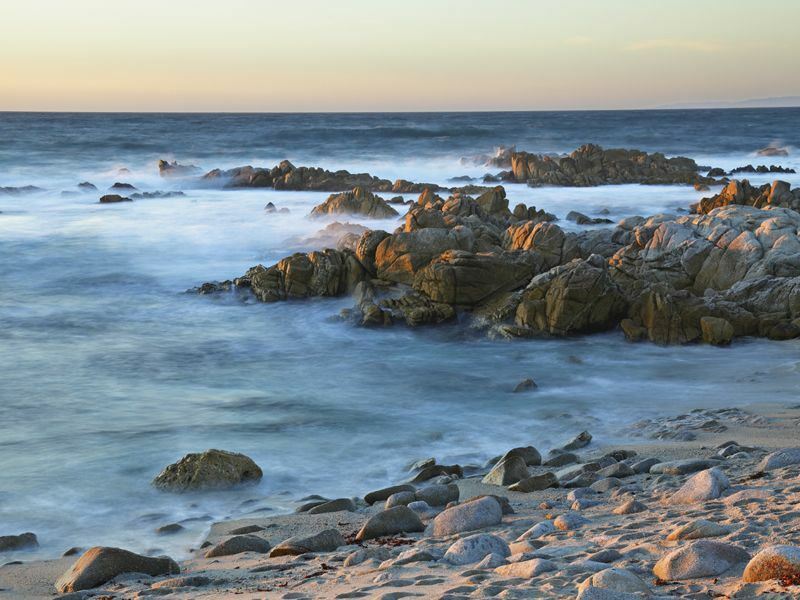 Monterey Bay is quirky, beautiful and very much a great place to kick back and enjoy.